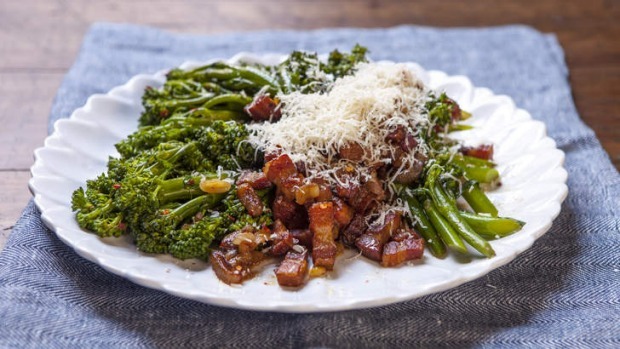 This is a wintry way to dress up broccolini. The speck adds a robust smoky flavour and richness that really clicks for me on a chilly night. 1. Cook the broccolini in a large pot of salted water for four or five minutes or until cooked. Drain, reserving a little of the cooking water. 2. In a large frying pan, cook the speck over a high heat for three to four minutes until it starts to brown — you shouldn’t need oil at this stage as the fat will render out of the speck. 3. Add the oil, garlic and eschalots and cook for a further three minutes, or until the garlic is fragrant and the eschalots have softened and started to take on some colour. 4. Add the hot broccolini, the chilli flakes and a splash of the cooking water. Toss through over the heat for another minute or so, reducing any liquid and coating the broccolini well. Pile on to a serving plate, spoon over the pan liquid, grate over the parmesan and serve.